Almost everyone who grew up in Amsterdam during the ’50s, ’60s and ’70s is connected by an unusual fact: they once played in one of the more than 700 playgrounds in Amsterdam designed by Aldo van Eyck. And outside Amsterdam too, almost every playground had one of his tumbling bars. This summer the new wing of the Stedelijk Museum in Amsterdam is staging an exhibition on the playgrounds by Aldo van Eyck. The soberly furnished space contains a number of original design sketches, photographs of playgrounds and photographs of the sites before redevelopment. On display to the right of the entrance, beneath the stairs, are works by Constant Nieuwenhuys, Karel Appel and Jean Dubuffet. Initiator and compiler of the exhibition Liane Lefaivre attempts to make a connection between the art brute of Jean Dubuffet, the work of the Cobra group, and Van Eyck's playgrounds – but unconvincingly, as the assertion on page 37 of the catalogue illustrates. 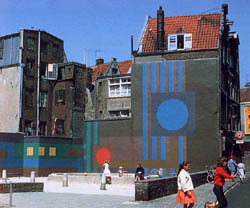 'Aldo van Eyck's coloured-pencil sketches of some playgrounds bear similarities to Cobra art. 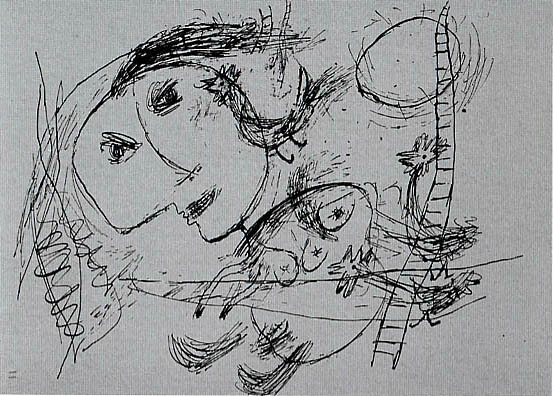 Just as the artists of this group tried to imitate children in their style of drawing (e.g. Promenade au Pays des Pommes by Corneille), Van Eyck, too, used coloured pencils for his sketches of, for example, the Zeedijk.' If there is any demonstrable connection between works of art and the playgrounds by Van Eyck, then the playground compositions are more akin to the work of De Stijl, Joan Miró and Jean Arp than to art brute. In collaboration with the neighbourhoods, the Site Preparation Service of the Department of City Development drew up the programme for the playgrounds and decided where they would be built. Because the department wanted to give every neighbourhood its own playground, they often turned vacant lots in the city centre into temporary play areas. Hemmed in by old walls and ramshackle buildings, these are the best known of the playgrounds. Van Eyck worked for the department until 1951 before setting up his own office, but he continued to design playgrounds for the municipality. Between 1947 and mid-1955 he designed around 60 playgrounds, and after 1955 he designed many more in the new post-war expansion districts. The latter were designed more or less in batches. Of the 700 playgrounds realised by Van Eyck between 1947 and 1978, 90 still maintained their original layout in 2001, though equipment designed by others had been added to some of them. Aldo van Eyck (1918-1999) was 28 when he joined the Department of City Development at Amsterdam Public Works in 1947. After working on city expansions for a short time, he was asked to design a playground for Bertelmanplein. 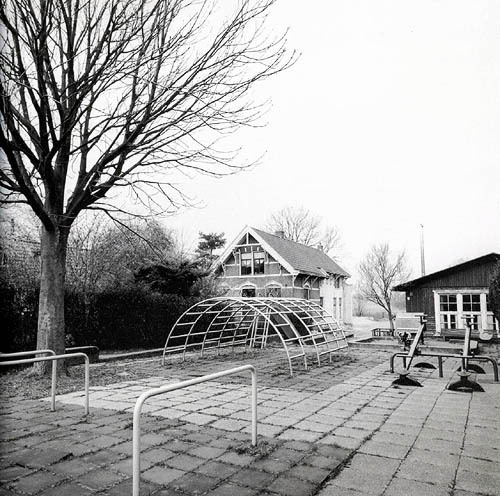 At the time, there were just a few private playgrounds in Amsterdam run by trusts and children had to be members to play there. Residential areas offered hardly any play facilities for children. It was Jakoba Mulder, head of the design group where Aldo van Eyck worked, who came up with the idea of providing a small public playground in every neighbourhood of Amsterdam. The first playground for Bertelmanplein was an experiment. Van Eyck designed a sandpit bordered by a wide rim. In it he placed four round stones and a structure of tumbling bars. The pit was placed in the north corner of the square, diagonally across from three tumbling bars. Bordering the square were trees and five benches. The playground was a success. Many designs followed and, depending on the site, Van Eyck deployed a number of compositional techniques. For him the playgrounds were an opportunity to test out his ideas on architecture, relativity and imagination. Relativity concerned a reality in which connections between elements were determined by their mutual relationships rather than by a central hierarchical ordering principle. As a result, reality was no longer dominated by a permanent centre. Instead, all elements were equal. The playgrounds designed by Van Eyck were exercises in non-hierarchical composition. Owing to the placement of such elements as benches, trees, hedges and different coloured paving stones, the slender metal tumbling bars had the same status and were as emphatically present as the big concrete sandpit. Its round form and rounded corners softened the presence of the sandpit even further. Van Eyck himself designed the playground equipment, including the tumbling bars, chutes and hemispheric jungle gyms, and his children tested them. To him, play equipment was an integral part of the commission. Its purpose was to stimulate the minds of children. The hemispherical jungle gym was not just something to climb. It was a place to talk and a lookout post. Covered with a rug, it became a hut. These sandpits, tumbling bars and stepping stones were placed throughout the Netherlands. Exhibition: Playgrounds by Aldo van Eyck, through September 8 at the Stedelijk Museum, Paulus Potterstraat 13, Amsterdam. Liane Lefaivre, Ingeborg de Roode (red. ), Aldo van Eyck. Playgrounds, NAi uitgevers Rotterdam, 2002, €24,- ISBN 90-5662-248-X, 144 pages. Francis Strauven, Aldo van Eyck. Relativity and Imagination, Meulenhoff Amsterdam, 1994, Euro 56,72 (still available in English).